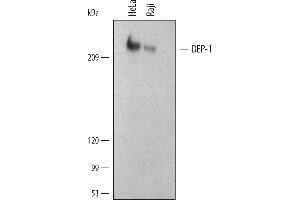 Detection of Human DEP-1/CD148 by Western Blot. Western blot shows lysates of HeLa human cervical epithelial carcinoma cell line and Raji human Burkitt's lymphoma cell line. PVDF membrane was probed with 1 ug/mL of Human DEP-1/CD148 Monoclonal Antibody. This experiment was conducted under reducing conditions. Specificity Detects human DEP-1/CD148 in Western blots. Bilotta, Dattilo, DAgostino, Belviso, Scalise, Bilotta, Gaudio, Paduano, Perrotti, Florio, Fusco, Iuliano, Trapasso: "A novel splice variant of the protein tyrosine phosphatase PTPRJ that encodes for a soluble protein involved in angiogenesis." in: Oncotarget, Vol. 8, Issue 6, pp. 10091-10102, 2018 Method employed by authors: Western Blotting (WB), Western Blotting (WB) (Sample species: Human). Spring, Lapointe, Caron, Langlois, Royal: "Phosphorylation of DEP-1/PTPRJ on threonine 1318 regulates Src activation and endothelial cell permeability induced by vascular endothelial growth factor." in: Cellular signalling, Vol. 26, Issue 6, pp. 1283-93, 2014 Method employed by authors: Western Blotting (WB), Western Blotting (WB) (Sample species: Human). Ambarus, Krausz, van Eijk, Hamann, Radstake, Reedquist, Tak, Baeten: "Systematic validation of specific phenotypic markers for in vitro polarized human macrophages." in: Journal of immunological methods, Vol. 375, Issue 1-2, pp. 196-206, 2012 Method employed by authors: Flow Cytometry (FACS) (Sample species: Human). Cabezón, Sintes, Llinàs, Benitez-Ribas: "Analysis of HLDA9 mAbs on plasmacytoid dendritic cells." in: Immunology letters, Vol. 134, Issue 2, pp. 167-73, 2010 Method employed by authors: Flow Cytometry (FACS), Flow Cytometry (FACS), Flow Cytometry (FACS) (Sample species: Human).